Jaipal Reddy, former Union minister, a former leading light of the Janata Parivar and now a Congressman -- “I am not the regular spokesperson, I am a special appearance spokesperson” -- has a reputation for being upfront. He reads the reviews on the backflap of his book, ‘Ten ideologies, The great asymmetry between agrarianism and industrialism’ and says one of the writers is miserly with his comments and proceeds to explain the point. He describes Mahatma Gandhi as the greatest figure of ‘organic renaissance’ followed by Raja Ram Mohan Roy for standing up for women’s rights and the abolition of sati. When it is pointed out that Roy was not entirely successful and neither was the Mahatma, Reddy observes, “The pioneers never succeed.” In an interview to Ananda Majumdar he explains why it is important to be ideologically oriented and the reason for writing the book. Financial Chronicle: There is a reference in your book about the Bharatiya Janata Party’s Murli Manohar Joshi and how he confuses history with mythology, philosophy with theology and astronomy with astrology. Is that something exclusive to BJP members? Jaipal Reddy: What I said about Murli Manohar Joshi can be attributed to others too. My book is meant to provoke, to draw a bigger line on current issues. I am trying to put the present in the perspective of the past. 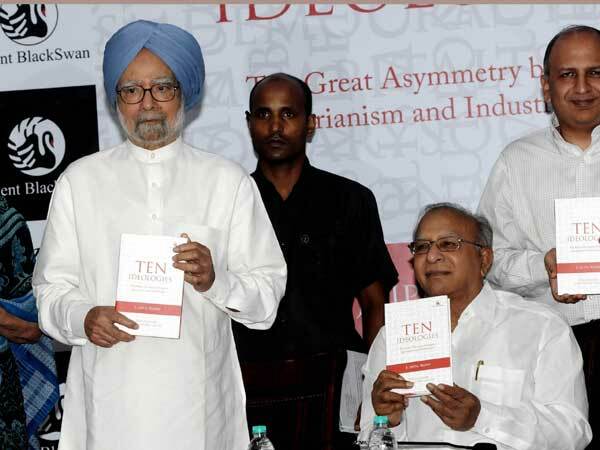 FC: Politicians have started writing books in large numbers. But a book solely on ideology is unusual. What prompted you to write it? JR: To the best of my knowledge, I have not seen a single book either in India or in the west, which deals with ten ideologies. We have seen fat tomes on individual ideologies but not an anthology of ideologies. Without putting together the ideas of all these ideologies in one go, we cannot explain them in a comparative perspective. FC: So what sort of age are we living in? JR: We are living in an Industrial Age, but except food there is nothing that binds the modern age to the previous age. In fact, we are still governed by the ruling passions of the agrarian age. FC: When you say “we” do you mean Indians? JR: No, this is meant for everybody. We are refusing to accept many things. For instance in the US, they do not accept devolution of powers or accept environmental problems. So, how are they different from us? FC: Where is India located ideologically? JR: We are in the east and we are still caught in the process of catching up with the west. Till 1650, Japan and China were far ahead of the west in terms of production and technology. When the west stole a march over them, the entire east lagged behind. FC: What does science or lack of knowledge of science have to do in all this? JR: The sense of history of science is very poor. Through technology you can transform things but not thinking -- things you can, thought you can’t. The mind is caught in the rut of the agrarian age, the philosophy of the agrarian age is with us but also with the Americans. FC: Do any of the Indians follow a genuine ideology or do they just create the illusion of having an ideology? JR: No, that’s not right. The leftists are ideologically oriented. Jawaharlal Nehru, Ashoka Mehta, Ram Manohar Lohia were centrists. In fact, the Socialists were centrists. FC: What about the rightists? JR: Without knowing that capitalism is modern, they think that they are rightists. They do not realise that Adam Smith and Ricardo, the founders of capitalism, were rightists. FC: So, what are the challenges? JR: Nothing short of changing the mindset of humanity. You must realise that until the French Revolution, there was no feminism and nuclear pacifism as the result of the nuclear bomb. I don’t like calm without a storm. Calm emerges after the storm and through the storm. Those who want calm without a storm are in a simpleton’s paradise. FC: One last question, what is your ideology? JR: I am a progressive liberal, a social democrat. We cannot remain without an ideology. Disclosure of ideology is more important than disclosure of assets and liabilities.